Moncton is often touted as being the fastest-growing region in Atlantic Canada for a variety of reasons, and one of them is because there is an important francophone migration from the north. As a direct result of the closure of mines, lumber and pulp and paper mills in Northern New Brunswick, in search of opportunities for a more promising future many young people have consequently flocked to the south in order join the city of Moncton’s bilingual work force. However, in Moncton, an officially bilingual city in Canada’s sole officially bilingual province, New Brunswick, it is surprising to see that, in recent years, with the increase of francophones in the Moncton area there has also been a rise in anti-bilingualism. Evidently, I could not agree less. Not only do I not agree with the ARANB’s language woes, but I think they should actually take up their issue with New Brunswick’s Department of Education and Early Childhood Development. If anything, it appears that the disproportionally low bilinguals in the province’s anglophone community likely reflects a deficiency in the type of education their school children are receiving. There are evidently no ‘insidious effects of French’ in the province and, in fact, one could even argue the opposite: In the 1990s, after the closure of the CNR locomotive shops, part of the reason the city of Moncton experienced such a dramatic turnaround was in large part due to the city’s highly bilingual workforce, mostly Acadians. Under Frank McKenna’s government, Moncton started playing host to a large number of call centres, which is one of the main reason why many Northern New Brunswickers have flocked to the area. In relation to the anti-French or anti-Acadian sentiment (why sugar coat it?) among the anglos of New Brunswick, sadly, it is nothing new. Historically, it could even be said that the province of New Brunswick itself was born out of the same anti-Acadian sentiment that gave birth to the Canadian Maritime provinces. Following the expulsion of the Acadians (the Grand Dérangement lasted from 1755 to 1763), these same British colonial authorities who had relentlessly persecuted and deported most of the Acadian civil population would give their former settlements to English planters following their expulsion. And, in time, fleeing the American Revolution, approximately 14,000 Loyalist refugees joined their ranks as they moved up north, establishing the city of Saint John, and settling all around the Saint John and St Croix River valleys. The British pre-loyalist population of what was at the time Nova Scotia (basically, old Acadia) did not always get along with the new arrivals, hence, to accommodate the Loyalists, in 1784, Britain partitioned the colony of Nova Scotia into three separate colonies: New Brunswick, Cape Breton Island, and present-day peninsular Nova Scotia (the province of the Island of Cape Breton would be merged with Nova Scotia in 1820). Simply put, by an Order-in-Council in Great Britain passed the 18th June 1784, New Brunswick was created as a distinct loyalist colony. And, not too long afterwards, in 1831, the New Brunswick and Nova Scotia Land Company was created as a means of transferring land held by the Crown to individual owners (2). Hence, all of the incredibly fertile dykeland farms that the Acadians had worked so hard to create to support their people for generations, for the last 150 years, as they lived peacefully alongside their native allies, the Mikmaq, would be given to the New England settlers who the British colonial authorities had imported in their stead. And, in much the same manner, when the American Loyalists came to Nova Scotia they would also occupy former Acadian lands. Since the end of the Seven Years’ War (in 1763) many Acadians were allowed to resettle in the pre-partitioned Nova Scotia, as long as they remained dispersed, so they scattered out in small coastal communities along Nova Scotia’s coast. They were not permitted to resettle on their former lands, nor were they permitted to resettle in the areas of Port Royal or Grand Pré. For all of those Acadian refugees who had somehow managed to escape the British persecutions and deportation, they resettled in other parts of Nova Scotia and New Brunswick which, in many cases, were either remote, or infertile. These new Acadian settlements were the seeds of our Acadian communities that we know so well today, and because of their location they relied mostly on fishery and later forestry―for the most part, lumberjacks and fishermen. 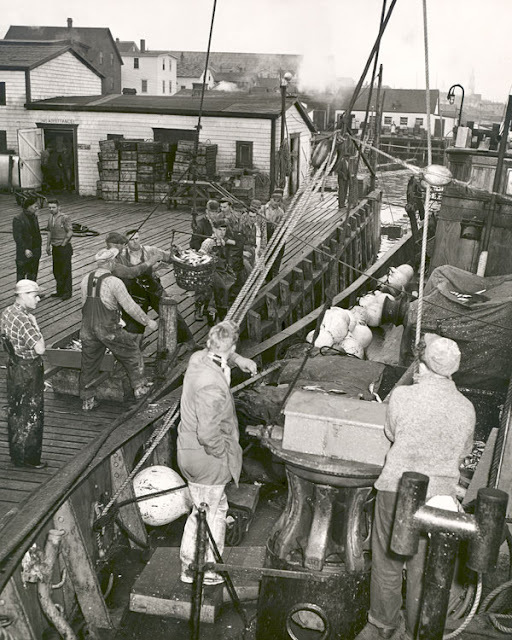 Unloading record catch of herring at Cheticamp, NS, ca. 1955. The seeds of our New Acadia were perhaps sown, but, given our history of persecution at the hands of the British colonial powers, by the time the 19th century came around, we had virtually no institutions that we could call our own. And, in relation to the Acadian population, the numbers were not as great as we know them today. According to The Canadian Encyclopedia: “At the start of the 19th century, there were 4000 Acadians in Nova Scotia, 700 in Prince Edward Island, and 3800 in New Brunswick. Their establishment and growth during that century was remarkable: they counted some 87 000 at the time of Confederation and 140 000 at the turn of the century” (3). Of course, it goes without saying that Acadians, alongside their traditional allies―the Maliseet and Mi’kmaq First Nations­―were all too often largely illiterate when compared to their contemporary Anglo-cultured countrymen. Now, the reason I go into any great detail in exploring some of our history is simply to make a point: As I mentioned earlier, New Brunswick itself was born out of anti-Acadian and anti-Aboriginal sentiments, and this is why the Anglophone Rights Association of New Brunswick (ARANB) fears bilingualism, and this is also why anglos put up such a fuss when the city of Dieppe tries to encourage bilingual signage in an stigmatized community of Acadian French-speakers that is clearly a majority, at near 73% of the total population. The anti-Acadian sentiment is also clear in all the hoopla that came up in the press around the attempt to change the name of Moncton’s Robinson Court to honour the Acadian poet Gérald Leblanc (4). Put simply, I keep reading about how the linguistic woes of New Brunswickers are ruining the province, and how French-speaking (Acadian) Northern New Brunswickers are ‘invading’ the South... It looks as though the anglo memory of the history of the Maritimes seems rather stunted. It does not appear that anybody clearly remembers why it is that so many Acadians live in Northern New Brunswick, or are dispersed along the coast in so many small fishing communities, in the first place. Then again, maybe we underestimate the very real motives for the existence of organizations such as the ARANB represents, for, maybe it is not bilingualism they fear, but rather they see us francophone New Brunswickers as Acajun Avengers, coming back to finally take our land and rightfully assert our place in history. Although, whatever the case may be, whether we are Acajun Avengers or not, I cannot help but to reiterate here that the name of the genocidal figure of Col. Robert Monckton does not do justice to the people of city of Moncton, regardless of the language they speak; it is a stain that should be removed.